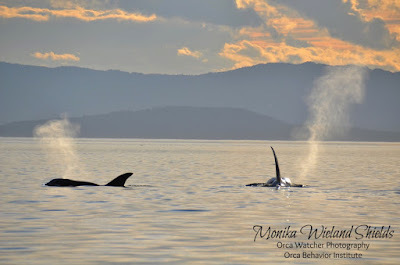 Orca Watcher: No Rs - But Ts, Ts, Ts! No Rs - But Ts, Ts, Ts! 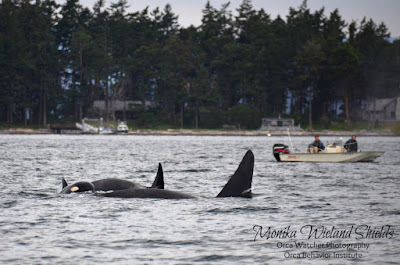 As the days continue to slip by with no sightings of the Southern Residents (since J-Pod last departed on June 1st), this year is beginning to feel more and more like the summer of 2013 when the Southern Residents were conspicuous only their absence. 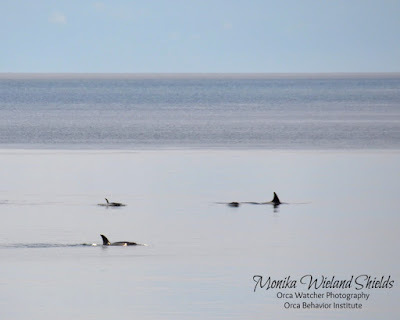 Despite the fact that we keep hoping for reports of the whales returning to inland waters, the lack of sightings should come as no surprise. 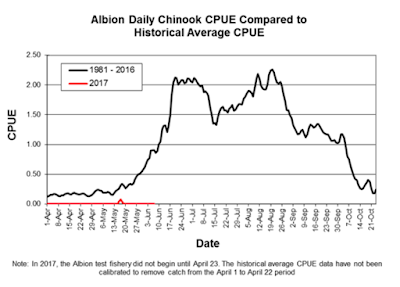 Not only are we one 4-year salmon cycle from the dismal year of 2013, but one glance at the Chinook salmon test catch data for the Fraser River shows how low the numbers are. 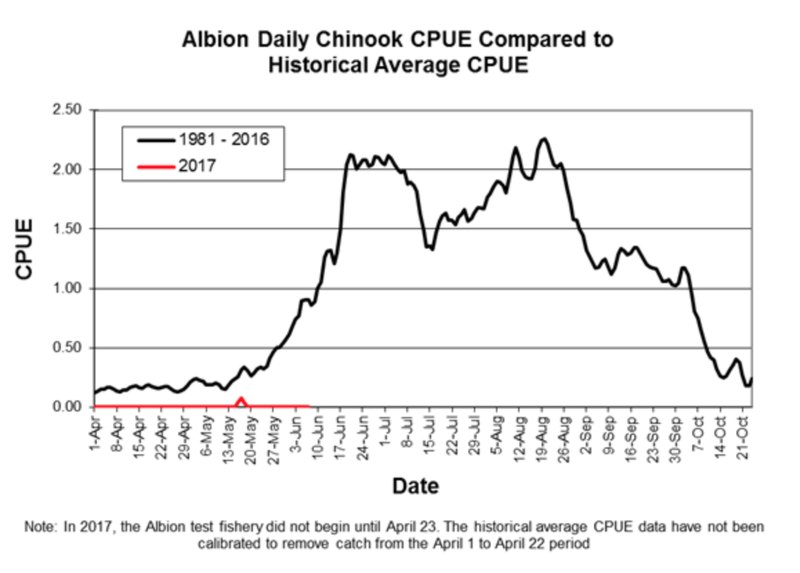 They've been doing regular test catches since the end of April and in all that time have caught less than 10 fish - it's a jaw-droppingly low number. 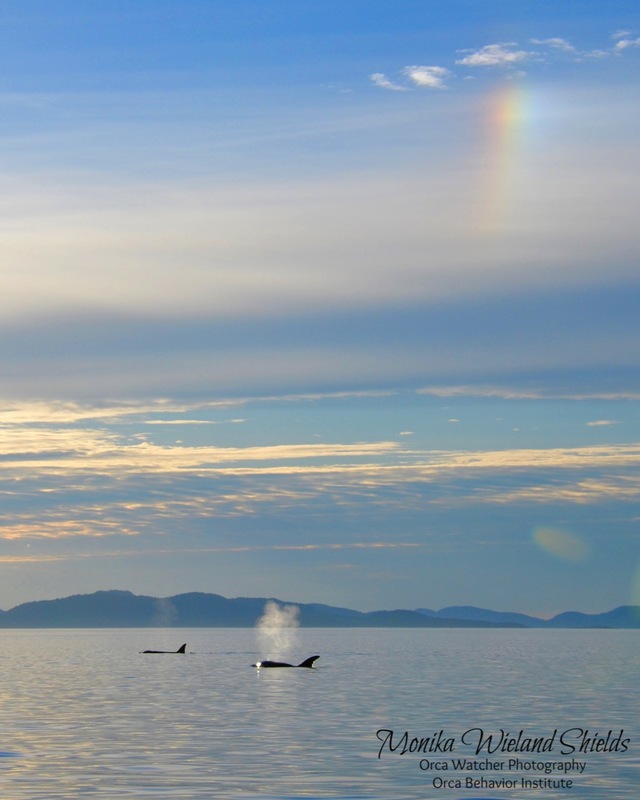 All we can do is hope they're finding food wherever they are hanging out and continue to advocate for what these whales need - more fish. 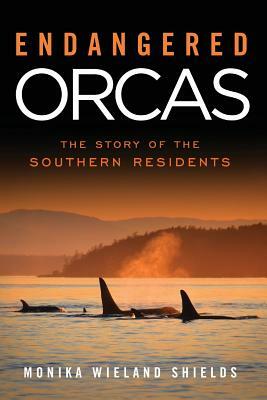 In the meantime, it's impossible not to enjoy our new neighbors, the transient killer whales. Whether by coincidence or not, as the Southern Residents have become more scarce, the transients have become more abundant, and the last week in particular has been phenomenal. 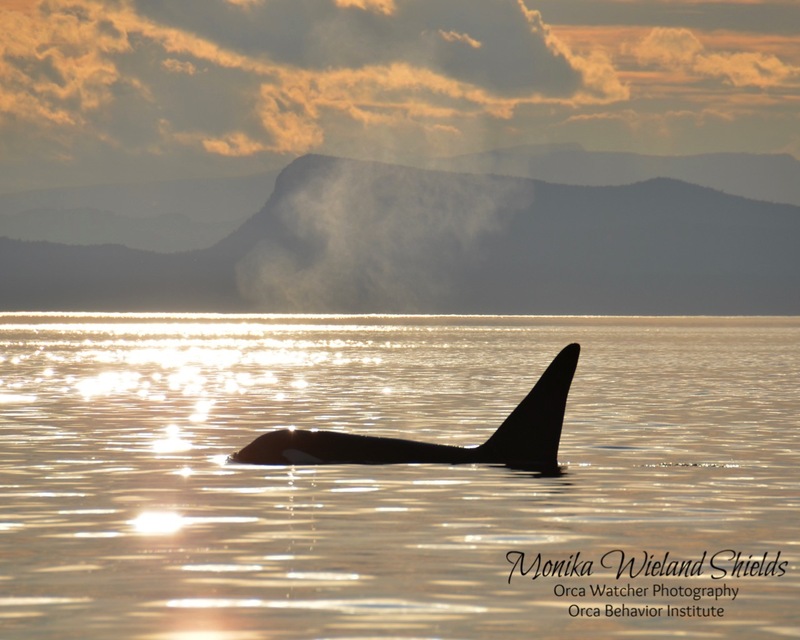 At the Orca Behavior Institute we've had six encounters with them in the last five days. 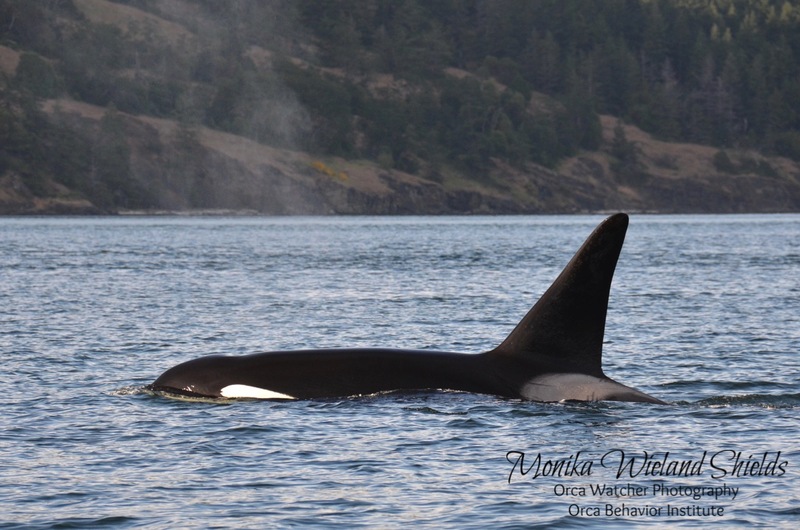 On June 7th, a large group of transients headed across Haro Strait and as they headed north one group broke off from the rest - the T2Cs. These are a fascinating family group for several reasons. For one, they're descendants of the famous marine mammal-eating whale T2 Florencia, who along with T1 Charlie Chin ate fish after 79 days of starvation in captivity. They had already been sold to marine aquariums when someone lowered their nets and freed them in the middle of the night. 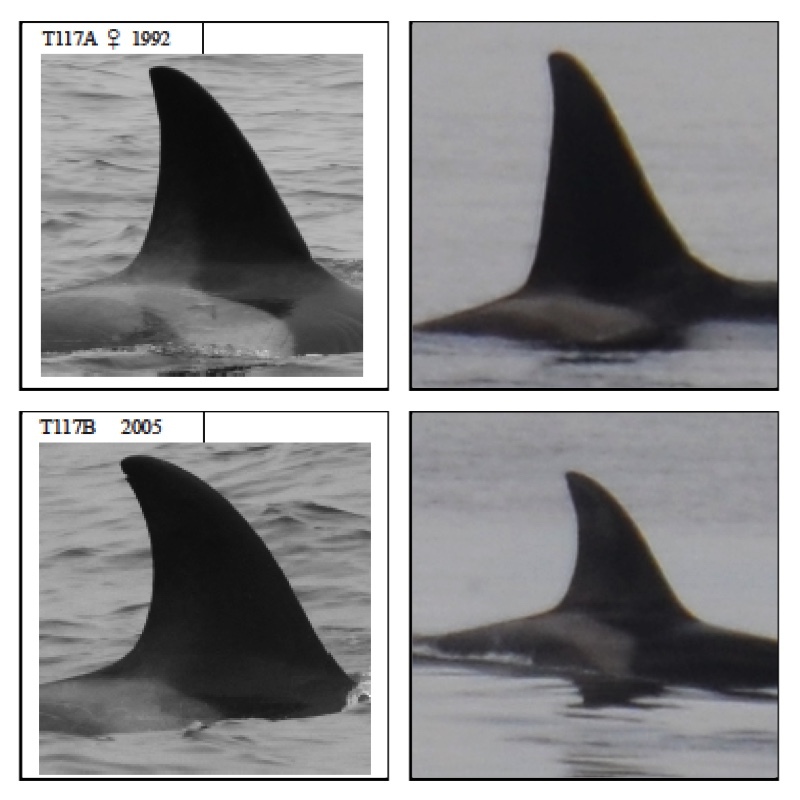 Secondly, T2C Tasu is the mother of four living offspring, including T2C2 Tumbo who is a twelve year-old male with scoliosis. His survival to this point, despite obvious physical deformation, is a testament both to his will to live and the altruism shown by his family. He is regularly seen trailing slowly behind the rest of his matriline, as he was when we encountered them. But when we saw them stop to make a kill, he came to join them in the feasting. 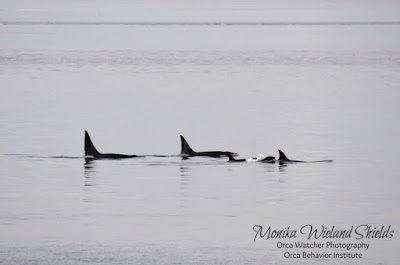 On a couple of days, we've also gotten to see the T65As off the west side of San Juan Island, and in both cases they spent time in resting formation. This shot was taken from Land Bank in the rain, which along with the calm waters made for a memorable encounter. On the morning of June 9th, word came in of a large group of inbound whales heading for San Juan Island. My first thought was, "Residents?!" I luckily got to the west side right as the whales did, and for 15 minutes had a magical moment where there were no boats on scene and no people with me on the shoreline as they approached. 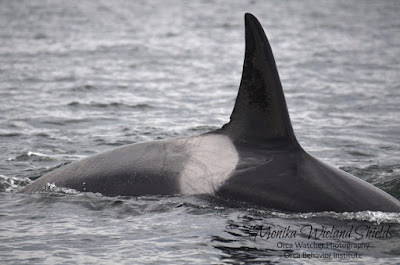 Not only was this not a Southern Resident, this was a whale I knew right away I had never seen before! 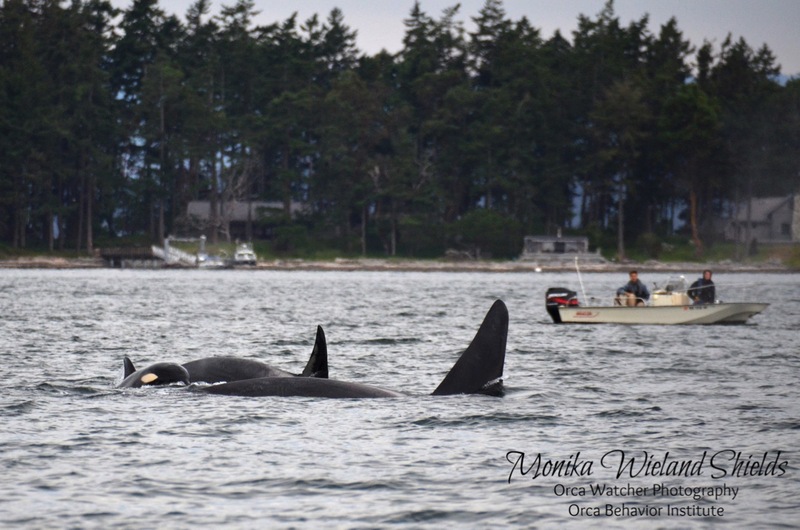 Turns out it was T170, a rarely encountered orca. 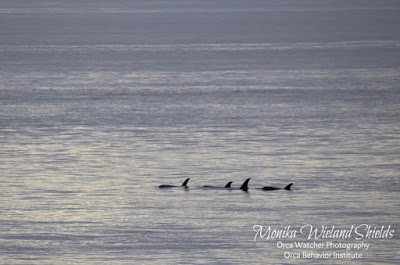 I heard this ID while the whales were still in sight, but who were all the other whales with them? For the moment, it didn't matter, and I just took in the tranquil morning encounter. Later though, of course I did want to know who all was there. 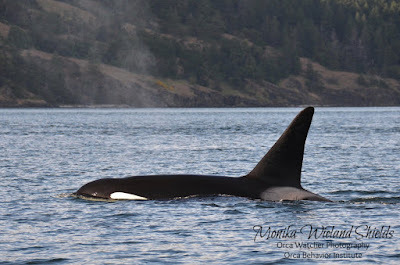 My friend and OBI partner Sara and I spent some time pouring over the transient photo ID catalogues, and were able to identify both some more common local visitors in the T36As and T49C as well as some more "exotic" whales in T172, T117A, and T117B. The T117s in particular were tough to figure out. As far as I know, they've never been seen here in local waters, and have changed a fair amount since their ID photos in the 2012 version of the catalog I have. 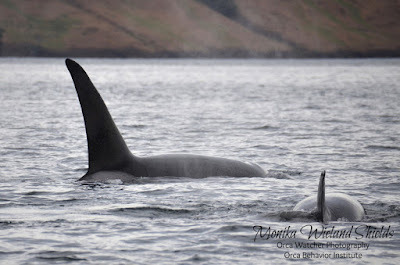 For one, T117A was thought to be a female and now has a fin sprout! Here's a comparison of their ID catalog photos and my heavily cropped photos of them from June 9th to give you an idea of how we figured out who they were. It was a fun puzzle to solve, and it's always exciting to "meet" some new whales! 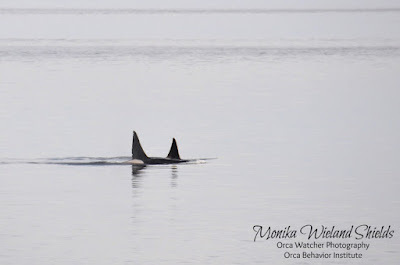 They were going slow enough that I ran from Land Bank to Lime Kiln, but unfortunately by the time they got there they had pulled way offshore. 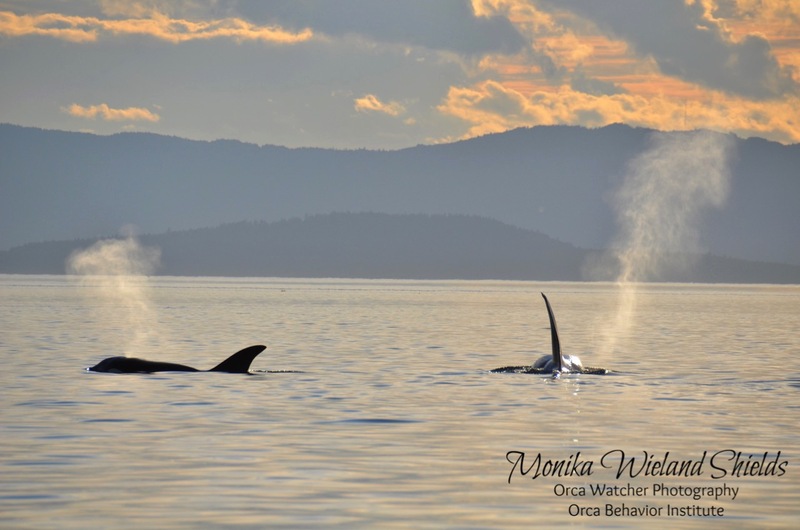 They continued north throughout the day, and while the "regulars" hung around for the next day, the "exotics" kept on going north and out of the Salish Sea. That doesn't mean the T encounters were over, however! 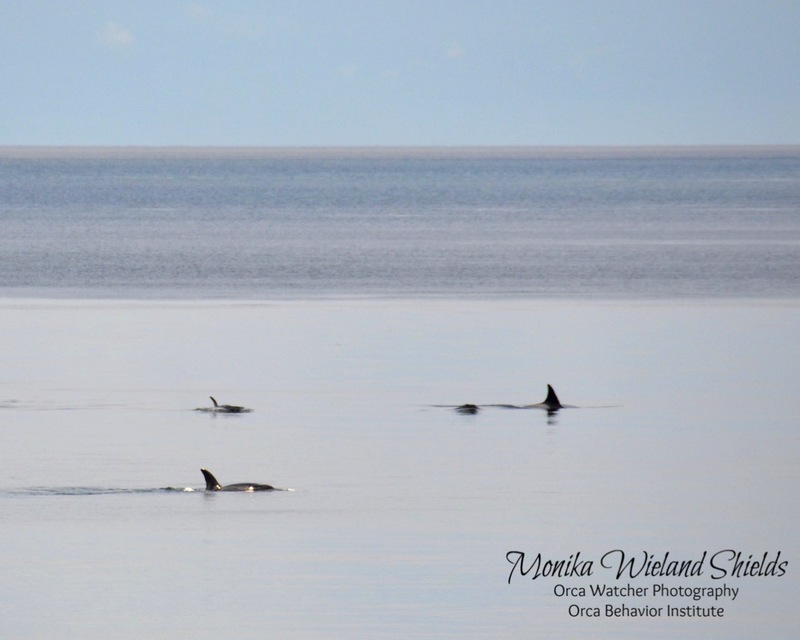 The T2Cs seemingly took up residence in San Juan Channel for 3 days, and last night, on June 10th, we headed out for an evening encounter near Waldron Island. 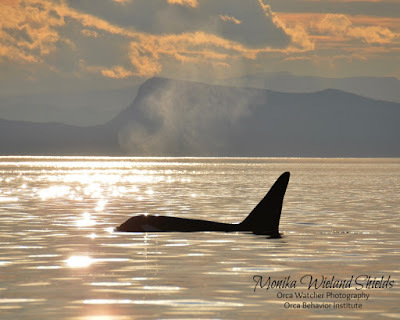 The whales were slowly moving north and the lighting was gorgeous. 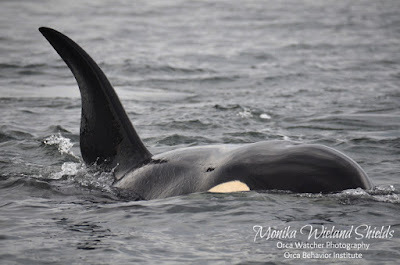 Again, T2C2 Tumbo, the male with scoliosis, was trailing behind the rest of his family. It tugged at the heart strings for sure when, on a couple of occasions, his big brother T2C1 Rocky broke off from the others and came over to spend some time with him. 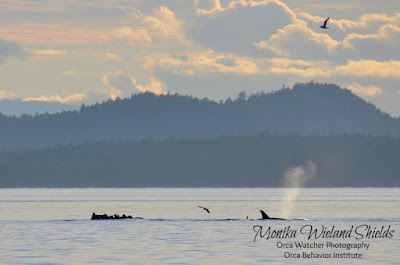 The other three whales went over to harass some seals hauled out on a small rocky outcropping. 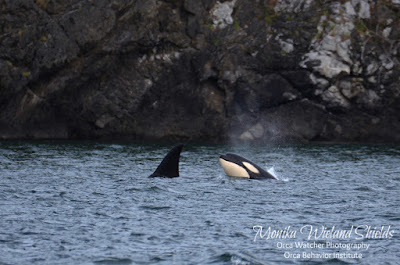 I don't know how shallow it was right there, but it was amazing how close the whales were able to get to the seals - close enough to scare the gulls off the rocks! 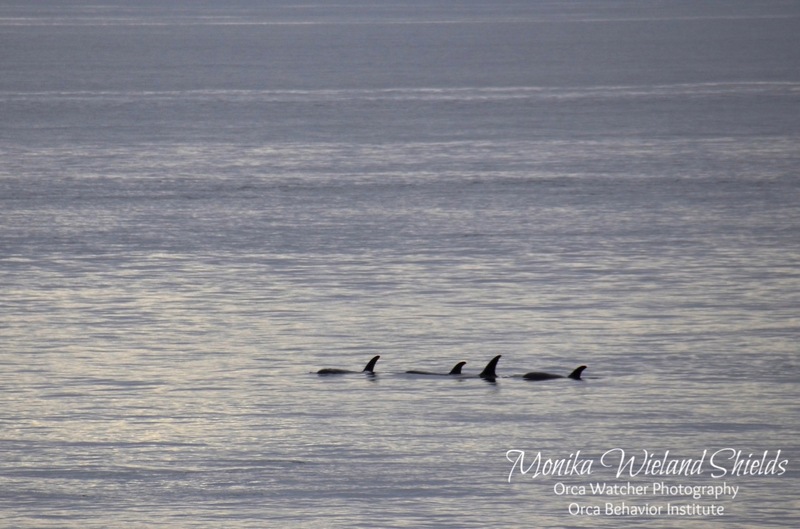 One seal even panicked and slipped into the water, but amazingly the whales, who seemed like they could have practically grabbed the seals right off their haul out, seemed to move on without eating anything. As the sun sank towards the horizon it was hard to leave, as the lighting just got more magical. 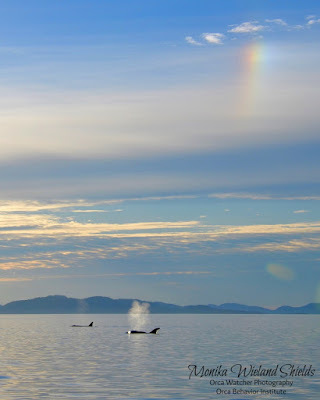 Eventually, we did turn south and head home to port as the whales headed north towards Canadian waters. 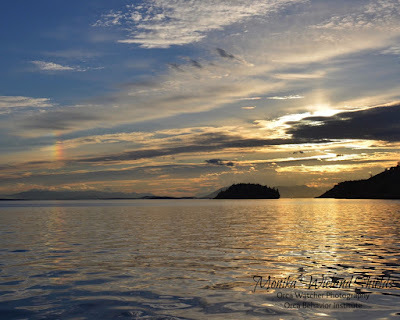 The boat ride home was gorgeous and I couldn't help but wonder, "What will the next week bring?" Lovely story and photos. Good to have you tracking the Transients and telling their story. I greatly appreciate and encourage you to keep using names as well as numbers.